I’ve always loved that passage in 1 John 2 where the apostle addresses children, young men, and fathers, and tells them why he is writing — giving a different reason for each in a whole kind of poem. This post is not about that passage. I’ve been reading The Narnia Chronicles to my oldest daughter since shortly after Christmas. This year I got the boxed set for her as a gift, planning to read them all to her, chapter by chapter. In a few years when my youngest daughter is about the same age, I will find a boxed set to give to her as a gift as well, and I’ll read them all to her, chapter by chapter. I have my own set, of course, and I could easily be reading to both girls from that set. For that matter, my oldest could read them herself now… but that’s hardly the point. We’re not quite through the second book yet, but I have to say that I think my hunch was right. And I want to urge other fathers to a similar course of action. I urge you to puchase a complete set of The Narnia Chronicles for each of your children, and read it to them personally sometime when they’re between the ages of 6 and 9. My apologetic for this lies within my own reasoning for doing this, which follows. The story is classic. You can’t frame it any differently, and there’s no arguing the point. It’s an introduction to a great Christian writer, and it’s a fabulous fantasy story that prompts the imagination, and as an allegory, can greatly increase the depth of understanding one has on spiritual matters. Its range of characters and subjects provide ample thought fodder for discussion together, during which a father can teach a child how to explore metaphors, to probe into questions too deep to comfortably fathom, to pick at them bit by bit, to pursue deeper understanding while remaining at peace with what we cannot know. The Narnia Chronicles is the proper length, with easy-reading chapters just right for one or sometimes two per sitting. The books go by quickly enough that there’s momentum through the stories, yet there are enough of them that the whole does not go by too quickly, and not so many that you’ve forgotten the beginning by the end, or worse yet grown weary and given up. The fact that it’s a series rather than a single book injects a bit of variety as well, with a new adventure in each book. 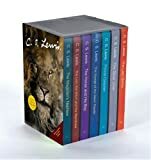 I want my daughters to have their own box set of The Narnia Chronicles. And I want them both to have the very set that their father read to them when they were young… perhaps a set they’ll read to their children, or perhaps a set that will grace their bookshelves with some permenance. It’s dawned on me that no matter what I tell my girls, no matter what kind of ribbing I give them, and no matter what lies I tell myself for comfort… they’re both going to grow up and leave home someday. And no matter when, it’ll be too soon. I want them to each have a set of books that they will remember having listened to while cuddled up with their daddy. Years from now, perhaps even after I’ve shuffled off this mortal coil, I want the handling of these books to move their memories, and place them back in my lap as a young girl. I want them to thumb through the pages and remember the time we spent together with the story, and to know that the book itself is only a symbol of the real gift I’m trying to give. I would most prefer a hardcover classic set from a good used bookstore, but there was nothing of the sort available when I needed the first of these two sets, and not likely to be in my price range in any event. Still, some of the boxed sets are more handsome than others, and the slightly larger paperbacks with colour illustrations are worth the few extra dollars. The challenge at present is to find a set with cover art that doesn’t make it look like the the book was based on the script from a major motion picture. The best age is probably a little different for every child. I could have started with my oldest a year ago, but I’m still in the window of opportunity with her. A year from now it won’t be the same. She’s in that stage, represented by this age range, where she’s moving away from having stories read to her, moving away from reading simple books aloud to us, and well into the era of reading “chapter-books” on her own. And yet, she’s not past the stage of being thrilled to have her parents sit with and read stories to her. She’s in that age range where she’s gaining an appreciation for books and a love of reading. This is the time when we want to encourage her to read and encourage her in what she’s reading. A set of stories like The Narnia Chronicles is one that she may even want to read to herself again in a few years’ time. Right now she’s reading Thornton Burgess books… not the 80’s reprints, but the ones published in the 40’s, some of them are the copies I read at her age, which were her grandmother’s copies when she was about the same age. It’s an age where reading and imagination must be encouraged, a strategic age to begin a lifelong love for both. Sometimes we fathers need a special focus to help keep us in a good pattern… like that of spending time with our kids. This is one of those focuses. My wife is perfectly capable of reading books to my daughter(s) — she’s already read pretty much the complete Little House on the Priaire series to our oldest daughter — but this one is for me to read to her. During these years when she’s starting school and making her own friends and exploring her own ideas, when evenings are starting to be spent on homework, clubs, and other activities, the natural course is often to wind down a lot of activities like this one… things we used to do for them because they couldn’t. At this age, kids can read for themselves, after all, and it can be a busy season when parents look forward to little more than the hour or two of quiet time when the kids are tucked into bed each evening. As those preschool years conclude, parents are distanced just a little from their kids, and this provides a means of reforming the transition so it’s less stark, keeping you involved longer. Hopefully it sticks beyond that as well. In our present culture when kids grasp mature subjects far too early, it’s important to help them hold onto their childhood a little while, and I think this may be one of the tools for that endeavour. I don’t know if much of this is significantly different for young sons than it is for young daughters, and I can’t yet attest to any long-term proof of whether I’m right about any of it or not. But you could do far worse than what I’m proposing, so I write to you fathers… so that you will read to your children. I agree wholeheartedly. I read the entire set to each of our daughters when they were in that age range as well. Sometimes, I remember, I’d keep reading even though I knew they had fallen asleep [we’d, of course, have to redo that bit the next night] but everything about those moments still lives inside my mind/heart, almost tactile, like some kind of texture – something that will probably accompany until senility either erases the memories or turns me into Digory.